Once you've installed Happy Checkout, you'll want to begin with setup. This article contains an overview of what each module does. If you'd like to get an overview of what a complete "Thank You" page looks like with our added modules, you can view this example layout. This will also show you where each module is added. The Checkout Styles you've configured in your theme will also apply to your customized thank you page, such as the colors or a logo. 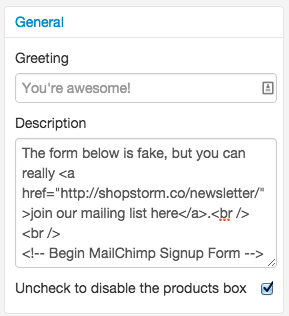 If you want to read more about configuring your checkout styles, please read this document. The "General" box will allow you to set an optional greeting. This will override the "tagline", which is the homepage description you've set for your store, if you enable it and will only be displayed if you have no logo set. 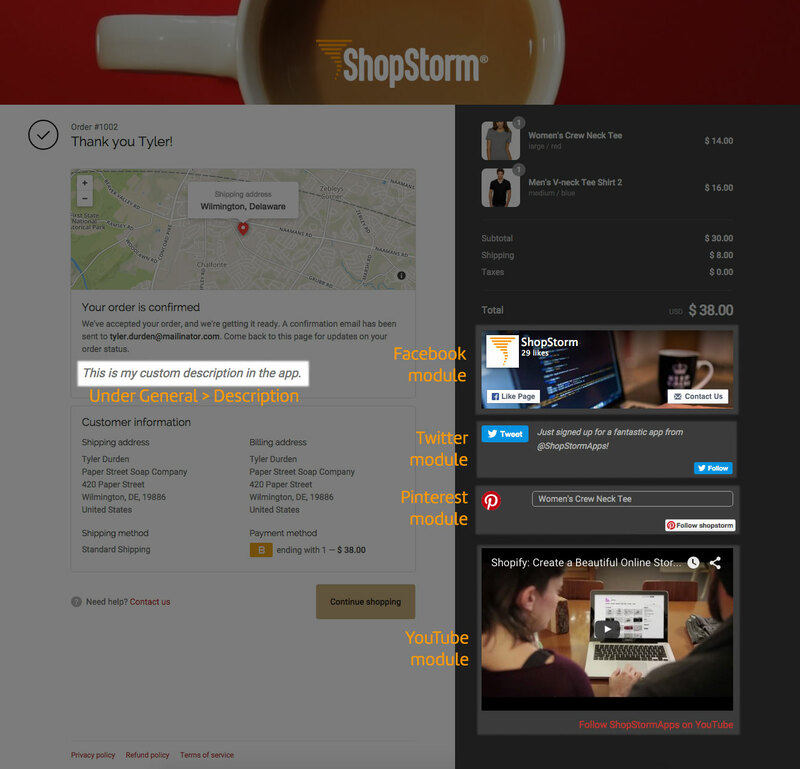 If you leave it blank, the homepage description will be shown below your store name or logo. Finally, you have the "products" checkbox. This should be enabled if you want to show customers what was purchased in the order. If you uncheck this, the products box will be removed from the order summary and will not show the products list. Adding your Facebook username will create the Facebook module, and you can configure which parts of the Facebook widget are shown to your customers. Use Small Header: Enabling this compresses the cover image you use to display a smaller version, and compresses the like buttons. If you enable this, your call to action button (or the share button if the CTA is disabled) will automatically be hidden. 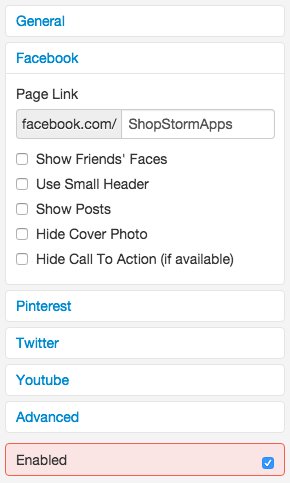 Show Posts: Enable this to show a (scrollable) window with your page's 5 most recent posts for customers to browse. Hide Cover Photo: Enable this to remove your cover photo and replace it with a white background. Hide Call to Action: If you've configured a call to action for your Facebook page, enabling this will hide it from the widget and will replace it with a "Share" button. Leave this unchecked to show your call to action button. 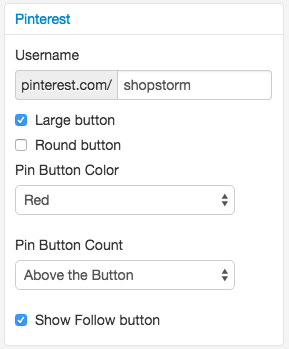 Adding a Pinterest username to this module will enable the Pinterest widget. 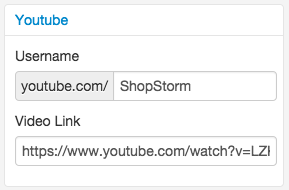 This will display two things: a link to follow you, and the ability to pin any of the products purchased in the order (shown in a dropdown). We recommend enabling Rich Pins to showcase your product with Product Pins when pinned from the app. Show Follow button: Adds a "Follow" button for your username below the Product selector for pinning. Adding a Twitter handle to this module will enable the Twitter widget. 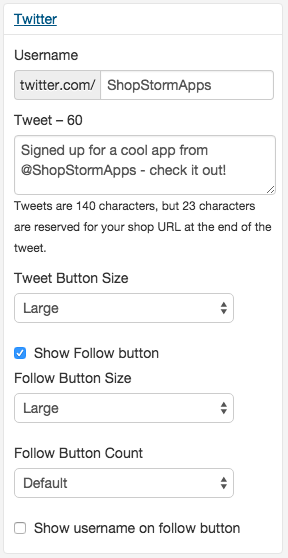 This will show a link for customer to follow you on Twitter, and give them a pre-made tweet that they can tweet out after purchasing by clicking the "Tweet it" button. You can enter the desired text for the pre-made tweet. 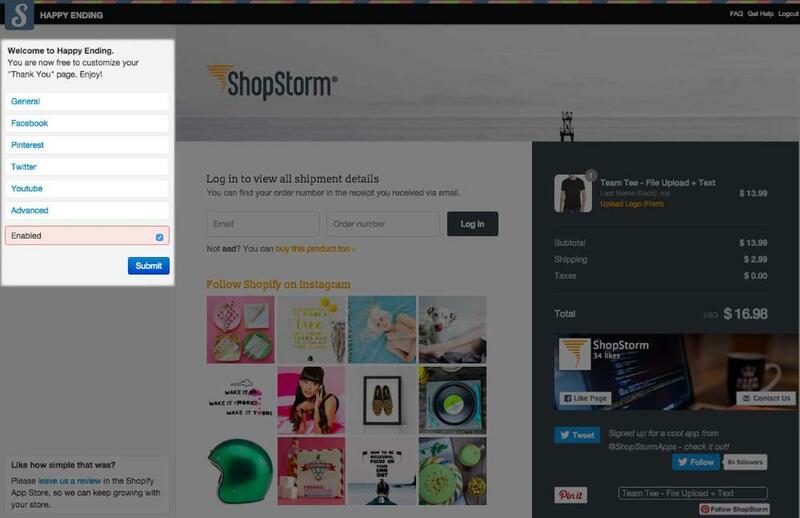 Tweet: Enter the text for a pre-made tweet for your customers to share (they can edit this tweet). Your shop URL will be added at the end of the tweet automatically. Note that it's not possible for us to insert products into tweets at this time, as there's no way to replace a "product" variable in the tweet text. If you'd like to add a video from a different service, we recommend using the "General" box and embedding the video via iframe there. For example, you could use Vimeo videos instead. The last module is the advanced module for custom CSS. You can read about using it here if you'd like to adjust the style of your Thank You page. Finally, don't forget to enable the app and click "Submit".